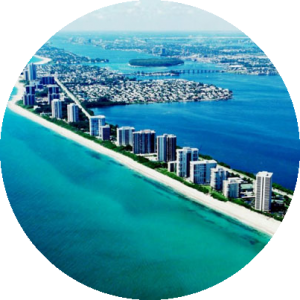 The city of West Palm Beach is home to sunny palm-lined streets, breathtaking waterfront views, quaint shopping districts, historic and scenic neighborhoods, and exciting year-round outdoor festivals. Downtown West Palm Beach is home to two a retail and entertainment district – City-Place and the Clematis Street District. These vibrant pieces of the city are lined with fashionable martini bars, trendy nightclubs, elite boutiques, and fine dining establishments. When the sun sets on West Palm Beach, you can indulge the most epicurean of tastes by candlelight at one of the many lovely restaurants. Every Thursday evening, downtown’s already animated nightlife offers even more in the way of exciting entertainment with the award winning, Clematis by Night free fountain side concert series. While there, visitors and locals have the opportunity to mingle among arts and crafts vendors, while enjoying the live entertainment. If you have an interest in the theater and the performing arts, the Raymond F. Kravis Center for the Performing Arts is the premier location to spend an evening. For museum enthusiasts, the Norton Museum of Art houses a world-renowned collection of European, American, Chinese and contemporary art. For those looking to enjoy the outdoors, the city’s teeming waterfront offers a walkways and fantastic views of Palm Beach and other surrounding cities. On the city’s western edge, one can hike, bike, and get a view of the Florida Everglades up close at Grassy Waters Preserve.